This list of herbs may provide addition nutrition and support for maintaining a balanced and healthy raw food diet. You won’t be eating large portions of herbs, but they all have their nutritional benefits and add zest and flavorings to your meals as well. They are loaded with nutrients for building strong healthy bodies and minds and the green ones contain chlorophyll, a very beneficial nutrient. 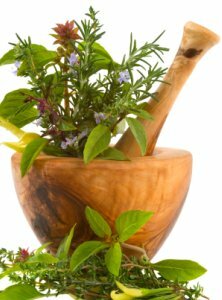 Many civilizations around the world, both past and present espouse the healing benefits of this list of herbs. You’ll probably recognize a few that you’ve already heard good things about. These days they’re used mainly for adding flavor to meals and not so much for their touted medicinal benefits, but that doesn’t mean we can’t craft them into our meals to help support a healthy body and mind. It’s best to eat varieties from this list of herbs in their freshly picked state, as green herbs, rather than their dry preserved state, but in the winter months that may not always be possible so just do the best you can. I enjoy adding a few fresh herbs to my morning green smoothie to change up the taste and to receive the nutritional benefits. As you look over the list below think about which ones you might add to your next meal. And don’t stop here; this is only a partial list of herbs and spices. Each time you go to the farmers market or your neighborhood grocery look at the wide variety of herbs and try something new. Start your own list of herbs and spices to track your personal consumption. You may come to prefer some more than others, but you’ll never know until you try. Sage - is said to decrease inflammation and help with memory function. It is quite high in Vitamin K, vitamin A, calcium, and potent antioxidents like flavonoids, volatile oils, and phenolic acid. Sage also contains several antioxidant enzymes, including peroxidase and superoxide dismutase (SOD). Sage helps with the digestion of fatty foods that are high in protein and difficult to digest. This is the end of this list. To see other categories of raw foods go to the links below.